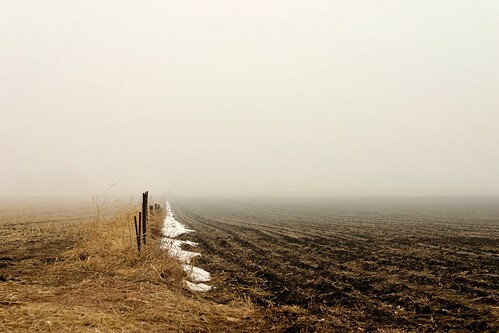 I found this an appealing vanishing point …the snowbank melting into the horizon… melting into the fog. From a recent drive up through Northwest Iowa to visit the home-place. Photographed with a Canon 300D and EF 50mm f/1.8 II lens. I adjusted the contrast and corrected for lens distortion with DxO Optics and warmed the tone a bit to reflect the mood of that day. This entry was posted in Documentary, Matt Niebuhr - Photography by Matt Niebuhr - West Branch Studio. Bookmark the permalink. Perfect. I love how the fence & field is sitting just below the center line. AWESOME.